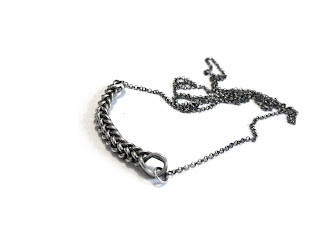 elaine ho: oxidized braid necklace new! 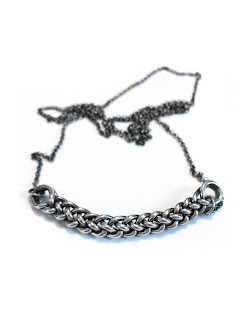 this is my new favourite necklace! um, because i make all my jewelry for myself. now if i could only figure out how to make my own shoes. 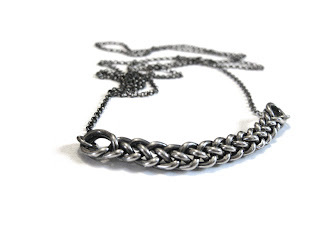 anyway, it's an oxidized silver braid! it's 24" all around, so you can just slip it over your head, keeping it minimal so no clasp is needed. each one is individually braided (by me), so they're all slightly different (because i'm not a robot). i oxidize it to a super dark matte black, polish the braided section to a bright shine, but not too much so there's still a ton of contrast with the black "lowlights", and then i hand rub the oxidized chains just enough to bring back a teeny tiny bit of shine, while keeping them completely black. currently available at mini minimarket in brooklyn, and coming soon to victoire in ottawa, general54 in montreal and in my on-line store and etsy of course!